We encourage eating locally and foods that are in season. Our farmers’ markets, roadside stands and local grocers are bursting at the seams with a variety of squash. While I love the flavour of butternut squash and feature it regularly in soups, the often neglected acorn or pepper squash is equally delicious and nutrient-dense, not to mention really pretty! 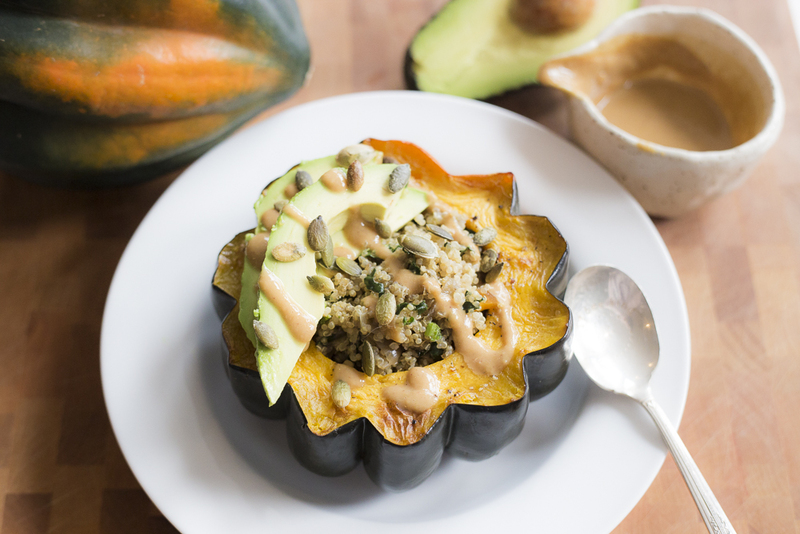 I love the idea of edible bowls, and squash makes the perfect bowl for just about anything. For this recipe, I chose quinoa because it’s a great plant-based protein source in addition to being mineral rich. Technically, quinoa is a seed, not a grain, so it is also gluten-free. Happily, it is being grown in Canada, which helps reduce the carbon footprint. My preference for preparing quinoa is to lightly pan-roast it after rinsing. This step enhances the flavour and results in a nice (non-mushy) texture. The sauce I recommend for this is one of our favourites from the Detoxinista website. It’s just so delicious and complements the flavours well. I used peanut butter; however, she uses a nut-free option in the original recipe. Preheat oven to 400 degrees. Lightly brush squash with oil and season with salt and pepper. Place on parchment (or Silpat) lined baking sheet. Roast for 40 minutes or until squash softens and is lightly browned. Meanwhile, heat saucepan at medium heat, add oil and saute onion. Once onion has softened, add rinsed quinoa and stir to lightly roast and remove excess water. Add vegetable broth and bring to a boil. Once boiling, reduce heat to simmer, cover and let sit for 15 – 20 minutes or until liquid has been absorbed. Remove from heat. Add kale and shredded carrot and lightly toss until kale has wilted and carrot has warmed through. Spoon quinoa mixture into squash bowls. Top with slices of avocado and toasted pumpkin seeds. Drizzle with Creamy Thai Peanut Sauce (*see below*). Enjoy! Combine above ingredients, except water in high speed blender. Add water as needed to reach desired consistency.